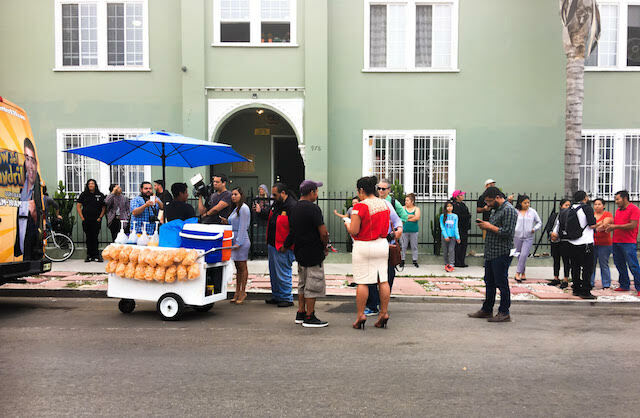 A now-viral video of a man arguing with a Hollywood food vendor and subsequently overturning the vendor’s cart on a residential sidewalk has inspired a swell of neighborhood and online support for elotero and his family—and highlighted the vulnerability that street vendors face in Los Angeles. The video, which was posted early Monday morning, has been viewed more than 4 million times. The elotero, or street corn vendor, in the video is 24-year-old Benjamín Ramírez. His father, Alex Ramírez, is a well-known elotero in the neighborhood, but Benjamín Ramírez only started selling street corn about two months ago. There is a couple—a man and a woman who appear to be in their late thirties that he encounters on his usual route—who would consistently hassle him in English, a language he doesn’t mostly doesn’t understand. In the video, items that line the cart, including containers, plastic silverware, and ingredients, fall out onto the street. At the end of the video, Ramirez describes the man in the video as a racist. "I&apos;m not a racist, you retard," the man responds. "I&apos;m Argentine." It’s unclear who called the police to the scene, but Ramírez says it was one of the man’s friends, who vouched for him. LAPD officer Liliana Preciado confirmed that police arrived on the scene July 17 but that no arrests were made. “The matter is an ongoing vandalism investigation,” she said in a phone call on Wednesday. The decision to ultimately post the video online a week after the incident was made by Ramírez’s entire family. His mother, Imelda Reyes, told LAist that she initially hesitated to make the footage public. “As an immigrant, you’re always scared to make a complaint,” she said. Reyes says her daughter, who works in a lawyer’s office, reminded the family that they have inalienable rights—and eventually convinced her mother to post the video. Reyes thought it might get a few views and raise awareness, but was pleasantly shocked to learn how much it’s being shared. She said she’s grateful for the support her family is getting. 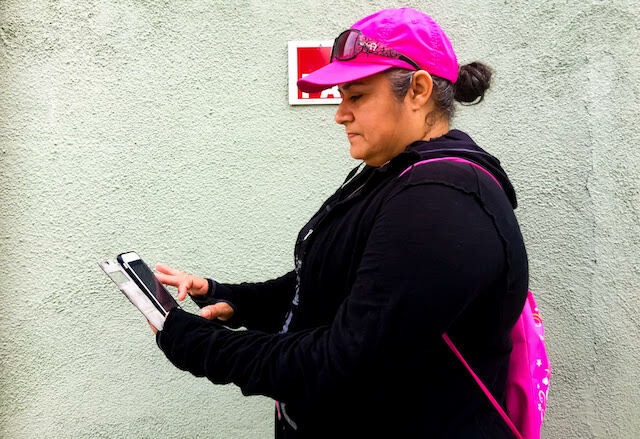 Street vendors in Los Angeles, many of whom are undocumented immigrants, remain systemically vulnerable. Ramírez said that the man in the video had previously accused him of not having a permit to sell food. Although the city has semi-decriminalized street vending, there’s still no process to get a permit or license to operate. In fact, despite its omnipresence and importance to the cultural fabric of Los Angeles, L.A. is the only city its size without some form of permitted street vending. Elotes, or corn on the cob, are enjoyed by many communities seeking a filling, quick snack in Los Angeles. But Mexican and Mexican-American communities take a special pride in the food. Mexico is after all the cradle of corn—and its popularity extends to the time before colonization. Today, eloteros like Benjamín Ramírez custom-make their own elote carts by hand to fit their client’s needs (his cart also sells raspados, a shaved ice topped with tropical fruits, sweet syrups, and condensed milk). Ramírez wakes up as early as 4 a.m. a few times a week in order to make it to the market to get the goods that make tender eloteros perfect: like herbs to season the water the corn is cooked in, cheese that melts perfectly on the kernels, and lime that adds a sharp acidity. Chile powder is also usually added; at the end of the video Imelda Reyes posted online, you can see the man who turned over the Ramírez cart is doused in it. The outpouring of support is also taking place online. The family has started its own online fundraiser—it had only collected $110 at the time of publication, but another much more successful online fundraiser is organized through a man the family said this morning they had no contact with at all. The family’s been in contact with a group that raises money to support street vendors who’ve been shut down by the city or attacked by individuals. Indie Brewing Company in Boyle Heights is hosting a fundraiser for the family this Thursday. Cartoonist Lalo Alcaraz, meanwhile, will make 50 limited edition prints available at Casa Fina at 7:30 p.m. in Boyle Heights this Saturday - the prints will be $20 and Alcaraz says he’ll donate half the proceeds to the Benjamín Ramirez. The show of Alcaraz’s work was already planned, but he decided to add this print to his show. “I decided to draw it,” Alcaraz explained, “because I was so outraged.” His sentiments echo what countless people have been saying online after watching the video.